This is a resource for the Nomad role, in particular as found in North America. As such it is useful for anyone playing a Nomad, or for Referees who want to have plenty of Nomad action in their game. 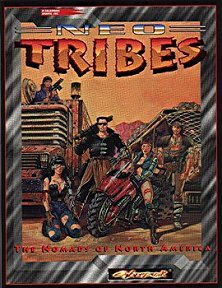 In it, there is information about Nomad life, the Nomad groups (Tribes) to be found in America, notes on creating and playing a Nomad character (and their equipment), and materials for Referees including sample Nomad Packs and a complete adventure. First up, Nomads in America. Forget visions of Mad Max convoys and rootless murdering thugs. There are only a few of those, and real Nomads look down on them. Nomad society is structured and peaceful, and most are pretty much like everyone else except for their mobility. There's a timeline showing how present-day Nomad culture developed from 1992 on as a result of the collapse of croplands and indeed ordered society. Many helped the rebuilding process, working construction jobs then moving on to the next city to rebuild that one as well. Others live off of scavenging from the ruins, transport cargoes around the country, some are organised mercenary bands, some are travelling entertainers. Nomads have a basic code that covers caring for family and working hard to earn money. There's a telling and prophetic statement that suggests that a lot of the problems were caused by a 'me first' attitude that covered itself by claiming that everyone else was racist, sexist or elitist just because they had something that the folks making the claim wanted. Nomads have rejected this and insisted on developing unity and mutual support instead. There are several different cultures and it is worth understanding them if you intend to deal with them. Agripacks are itinerent agricultural workers, poor and ill-educated, often abused, but determined to work for whatever they can get. Then there are the Native Americans, many of whom have gone back to ancestral nomadic ways rather than live on reservations. There are also Romany (these days, 'gypsy' is seen as a slur so I won't use that although it's what they are called here) who are traders and fixers... and swindlers and theives. The carnies or circus people, often confused with the Romanies, are a quite distinct lot, travelling around bringing entertainment to the masses (and often cheating them...). Then, of course, there are the bikers. Unpredicable and dangerous, other nomads reckon they have given the nomad lifestyle a bad name. There are others, but these are the major cultures. The groups they are found in are classified by size, from Families of 10-100 people up to Nations of up to a million - not generally all found in the same place, of course! The Nation is the newest group, and is formed of several Tribes with allied interests. The next chapter deals with the seven main Nations, describing each one in detail. It's reckoned there are about seven million nomads in North America and at least half have affilitated to one of the Nations. The largest is the Snake Nation, which is a fairly loose federation of people who want to have a voice in 'normal' politics, to represent all Nomads... having formed in response to the formation of the other Nations! Then there are the Jodes, formed for mutual preservation of their families and a chance to earn their own way. The Blood Nation has its origins in Miami, and although they grew out of drug gang culture, hence the name, they are now united by faith (Santeria and Voodoo) and earn their livelihood as travelling entertainers operating out of what remained of the Disney resorts in the area until they were driven out and became completely nomadic. The youngest Nation is the Metas, who are actually a corporation (Metacorp) in their own right. Their origins involve disenfranchised military men who felt abandoned and built their own organisation which is a maritime construction and security firm. Then there are the Aldecaldos, refugees from the remnants of Los Angeles determined to make the world a better, safer place step by step. The Thelas Nation are seaborne nomads, often derided as pirates, found in the Caribbean. The Folk Nation is based around black culture, with origins in Chicago gangs. There is also a kind of unofficial eigth nation called the Raffen Shiv, most hated of all - even by other nomads. They are bandits, theives and worse, stealing from anyone they can. Now we know who they are, how about making a Nomad character? The next chapter brings everything you need including new Roles, a Nomad Lifepath, and more ideas than you can shake a stick at. It shows how the conventional Roles can also blend into a Nomad pack. There is a wide selection of nomad equipment too, the stuff that turns a life on the road from a survival scrabble to something a bit more pleasant, even though it is still a hard life. This includes vehicles, even notes on customising bikes, and weapons. Next up, Running Nomads is aimed at Referees, and covers ideas on running Nomad campaigns, involving more standard 'punks into Nomad groups, and a whole bunch of resources from Nomad economies to weaving the Nations into your plots. A few sample packs are followed by a complete ready-to-run adventure, Chicago: The Adventure. Its intention is to introduce the nomad lifestyle and it can follow on after another campaign or serve as a campaign starter in and of itself. This sourcebook presents a diverse range of ideas to expand the whole concept of Nomads whether you want to play one or, as a Referee, run a Nomad campaign or just have the party interact with Nomads whilst going about other business. Have fun on the open road!